Bring people together and move your business forward with crystal-clear calls. Empire Communications offers a wide range of Smart, IP, and Analog Conference Phones designed to handle all of your conference calling needs. 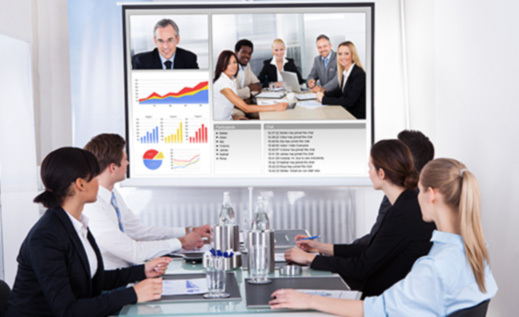 Smart conferencing for all your meeting rooms. Make it feel like everyone's together in the same room. 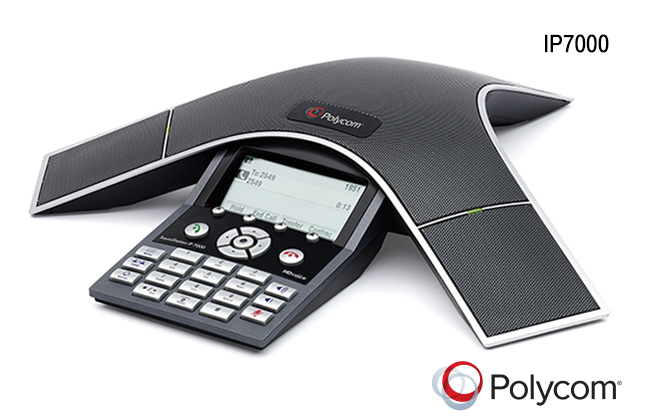 The Polycom conference phone collection is the gold standard for speakerphone technology that delivers the clearest sound to every participant, in every location. The advanced audio innovations allow each conference phone to intelligently adapt to different room environments. So everyone can hear and be heard, even when more than one person talks at a time. You'll eliminate confusion and enhance productivity. Not a single word—or opportunity—gets missed. The conference phone reimagined for open SIP environments OR for Skype for Business and Microsoft Office 365 Cloud PBX. 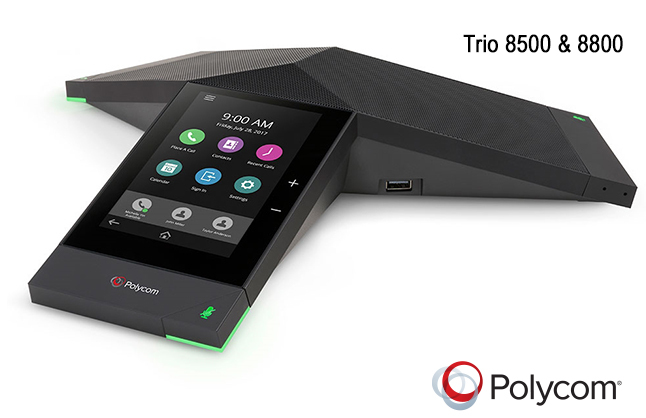 Polycom Trio™ 8800 is the conference phone reimagined. Marrying world-class audio conferencing experience, with business-class video and content, the Polycom Trio connects to the leading unified communications platforms of today and tomorrow. Microphone Range: 20ft, with optional expansion microphones or multi-unit connectivity. Ideal for boardrooms, conference rooms, auditoriums and executive offices. Built-in Power over Ethernet (PoE). An optional A/C power kit is also available. Large, high-resolution display with XHTML microbrowser – enables new applications that make conference calling easier and more functional. Automatic Gain Control, which intelligently adjusts the microphone sensitivity based on where participants are seated. Strong, robust SIP software – leverages the most advanced SIP endpoint software in industry. Built-in 2.5mm applications port, which enables you to connect the conference phone to a mobile phone for productive calls even where there is no network connection available(or to a computer for calls using PC-based softphone clients). Compatible with the Polycom HDX video conferencing system to create a complete, integrated voice and video-conferencing solution. 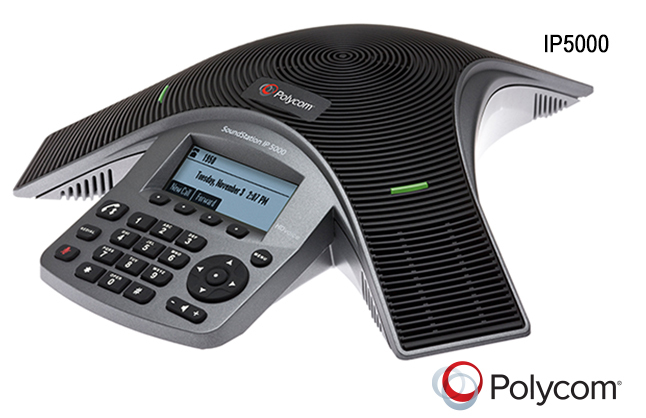 Download the Polycom Soundstation IP7000 Data Sheet to learn more. Microphone Range: 12ft, designed for small to midsize conference rooms with up to twelve participants. Option expansion microphones available. Integrated Power over Ethernet (PoE), (A/C power model is also available). The high-resolution display enables robust call status, on-board configurability and multi-language support. 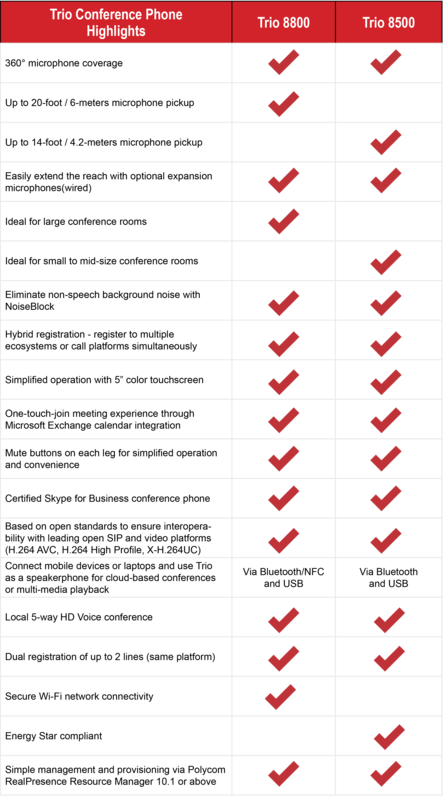 Download the Polycom Soundstation IP6000 Data Sheet to learn more. Microphone range: 7ft, designed for executive offices and smaller conference room with up to six participants. Built-in Power over Ethernet (PoE). An optional A/C power kit is also available. The high-resolution display enables robust call status, on board configurability, and multi-language support. Please do not hesitate to contact our Sales Department (at Sales@empire-team.com) or talk to someone in person by calling 1.888.618.8847. We'd love to hear from you. Download the Soundstation IP 5000 to learn more. Also download the data sheet for the SoundStation® Duo - for use in IP or Analog mode in small to midsized rooms. 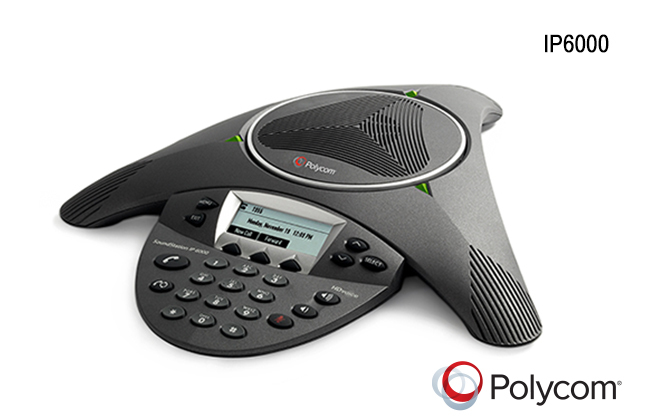 and the data sheet for the Polycom® VoiceStation® 300 Crystal-clear conferencing for smaller rooms and desktops. SoundStation2™ Analog conference phone. The standard for everyday conferencing in small to midsize conference rooms SoundStation2 is the ideal conference phone for small to midsize conference rooms that seat up to 10 participants. Polycom Acoustic Clarity™ technology delivers exceptional performance and voice quality, making your conference calls clearer and more productive. Industry-leading full duplex technology provides natural, simultaneous two-way conversation without clipping or drop-outs that are common in traditional speakerphones. Users can speak in a normal voice and be heard clearly up to ten feet away – making every call a more productive call. Dynamic Noise Reduction (DNR) actively removes background noise such as projectors and ventilation systems, while 360-degree microphone coverage with intelligent mixing highlights the person speaking, not the distracting ambient sounds, for crystal clear conferencing. It also features technology that resists interference from mobile phones and other wireless devices, delivering clear communications with no distractions. 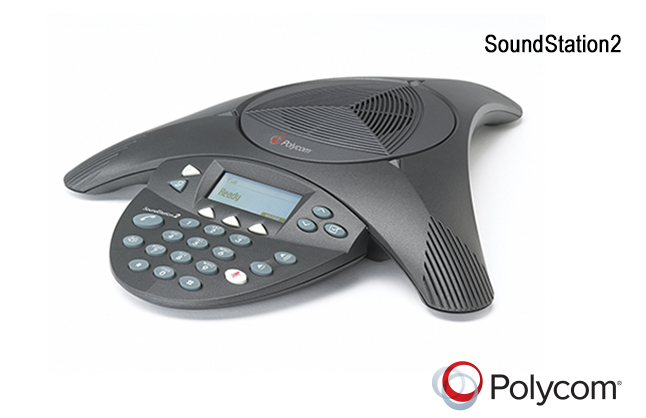 Download the Polycom SoundStation2 DATA SHEET to learn more.